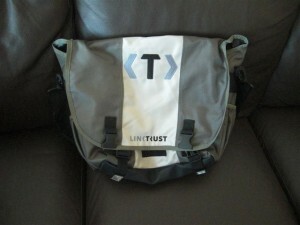 At ad:tech San Fransicco LinkTrust were handing out some great bags as free give aways. I asked if I could please have one, however they had just run out. My friend Heather Smith also asked for one and she gave them her card and asked if they could both be sent to her address. A few weeks later 2 bags arrived at Heathers house from LinkTrust. By this time I was in San Fransisco heading for London and Heather was in Vancover. So when I meet up with Heather at the show she gave me the bag. What I did not expect was that Carol-Lyn Jardine from LinkTrust had been following the show saga and was here at Affiliate Summit checking up that I had received it. This is amazing customer service for someone who has not bought the product yet and who has only shown interest. Keep up the good work and thank you for the bag Carol-Lyn Jardine and LinkTrust !